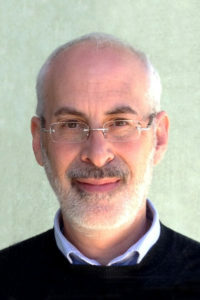 Steven Wolinsky, MD, ’82 GME, chief of Infectious Diseases, was the corresponding author of the study, which found HIV replicates in lymphoid tissue, even when undetectable in the blood of patients on antiretroviral drugs. A team of international scientists led by Northwestern University found that HIV is still replicating in lymphoid tissue, even when it is undetectable in the blood of patients on antiretroviral drugs. The paper was published in Nature. The team examined viral sequences in serial samples of cells from lymph nodes and blood from three HIV-infected patients from the University of Minnesota who had no detectable virus in their blood. Scientists found that the viral reservoir was, in fact, constantly replenished by low-level virus replication in lymphoid tissue with infected cells then moving from these protected sanctuaries into the blood. Other Northwestern authors on the paper include Eun-Young Kim, PhD, research associate professor of Medicine in Infectious Disease, Sudhir Penugonda, MD, MPH, ’06 ’10 GME, research assistant professor of Medicine in Infectious Disease and Ramon Lorenzo-Redondo, PhD.